Get Your FREE REPORT from Direct Mail Agency of High Value Clients in Your Area! You are busy, sometimes too busy with your clients and running your business to put time into marketing or effective direct mail campaigns for your independent financial adviser colleagues. Your practice is doing well, but you need new clients, to expand and to replace those who have moved on. You know that asking your existing clients for referrals, in the way you do now, isn’t getting the required number of new clients for your IFA practice. That’s where Direct Mail Agency can help you. We already help one of the leading IFA Networks produce literally thousands of leads every year. Leads that turn into high value clients. We target exactly the type of clients you want. Affluent and high net worth individuals. You may have thought about doing seminars. This is an excellent way to meet new clients. A great way for you to show off your expertise in financial advice. Whether you speak or you get a guest speaker, the conversions we see through financial advisor seminars are impressive. Some IFAs prefer to skip the seminar route. They focus on inviting people for appointments. We help here too. One of our Partner clients just experienced one of the lowest cost per new client costs ever by using our specially designed lead generation direct mail campaign. Speaking to Independent Financial Advisers, we know that you are very impressive in front of prospective clients. You genuinely care about their financial wellbeing. But, its the getting you in front of new high value clients that is the sticking point. You just do not have a regular flow. Imagine if you did have a marketing system that operated for you, using the very best data, tried and tested campaigns and at a cost you would cheerfully pay. Of course, you could just try buy clients from someone in your IFA Network. That alternative usually has a very scary cost attached. Which you do not need to pay. 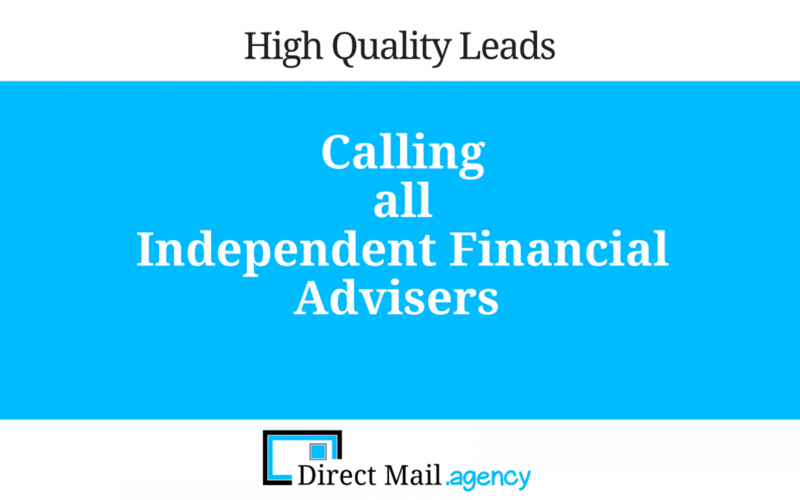 Independent Financial Advisers can get a marketing to the affluent system from Direct Mail Agency. A system that produces high quality IFA leads which you can enjoy converting into your new clients. Clients that will become some of your best clients too. Clients that will recommend you to others. Direct Mail Agency uses tried and tested mailings, that work. At a very competitive price. Discover how many high value clients you can target nearby for FREE. Understand how much each one of these clients would be worth to you and your Return on Investment. To get this FREE REPORT click here. Call Graham Arrowsmith, founder, DirectMail.agency on 01535 654930.